at various Frequencies, depending on R1 and C1. 10Khz and the current is about 525 Ma. aproximately 20 Khz and the current is about 180 Ma. Reducing the value of the C1 will increase frequency and Visa Versa. Reducing the value of R1 will allow for lower operating voltages. R2 can be a potentiometer for continuous current control. Other SCR's will work but will may require some part value changes. with an oscilloscope that has been calibrated and connected across R2. this resistor and the LED, can now be calculated. 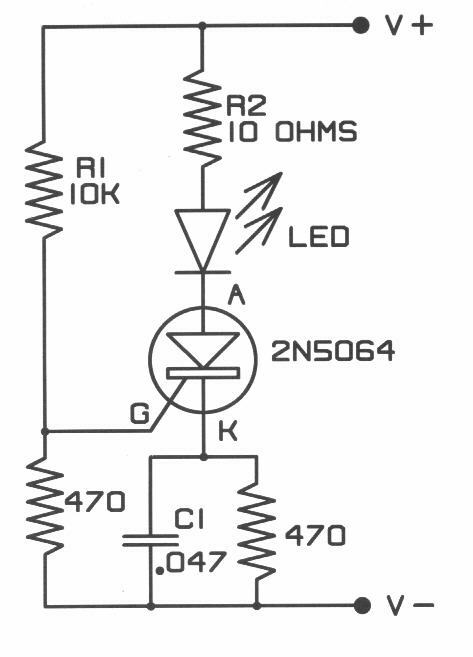 LED Currents up to 10 amps may be achieved with this circuit.